July 2015 – Share SharePoint Points ! Need to upload a file to already created SharePoint site. Use REST(not even CSOM) will be used in order to create. API call will be send from some other machine(not SharePoint machine) which is in same domain and can access the SharePoint site. 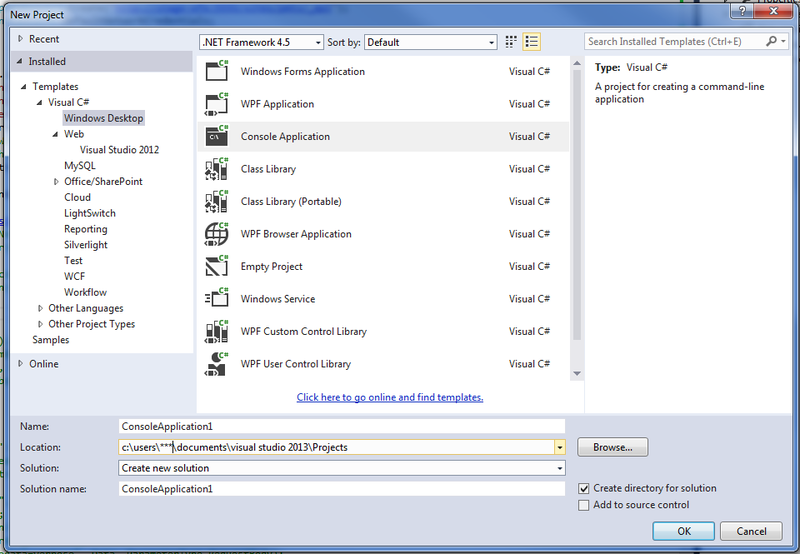 1) Create a simple console application with c# selected language. 5) Now application is ready to run. Make sure that all the namespace issues are resolved. 6) It will take some time to create site but output window will display the details it got from the Request. Hope this information is helpful to you. Thanks for time. We all aware the SharePoint exposed REST Api in order to perform various action at client side. There are some other ways also which a developer can adopt instead of REST(like CSOM) but that requires again client context. So it is recommenced that if we are using SharePoint Apps then use CSOM to get and update the data. Where as REST can be used in apps as well as some external applications. This blog is intended to show how user can utilize the REST api and get the SharePoint Search results. There are few pre-requisites or conditions which must be fulfilled before proceeding further. The machine where this code will be executed must have access to sharepoint site which means machine must be either in same domain or cross domain accessibility is there. Search must be configured at SharePoint server. Data must be properly crawled and you must get some results when searched for some keyword. 1) Open the Explorer or any desired location and create a text file with ant desired name. There are few challenges which I faces if we try to work with such kind of requirements. The authentication tokens and RequestDigest data are the crucial things to retrieve. Just a little explanation about the above code, this code is actually getting the request digest first and then in second REST request it will pass the same reader digest. There are few chances that this code will throw 401 unauthorized error if user does not have permission on sharepoint site. But there are option to hardcode the credential too using NetworkCredentials object commented in above code. Reassign a workflow task – Task update was not accepted. To edit a task associated with a workflow task process, you must be the person to whom the task is currently assigned.